Its always difficult to keep up with drawing the circles during the season. Some drawings come easily, but some are a much more taxing proposition. Funnily enough, it’s not always the large and complex formations that present a problem, although as you can imagine, the more complex a formation the longer it might take to draw. Sometimes you come across a formation (or two) that you just don’t see geometrically, and it is they that can have you scratching your head for weeks, or sometimes months on end. It’s not always a complexity issue, every geometer has their blind spots, things that don’t come easily to them. 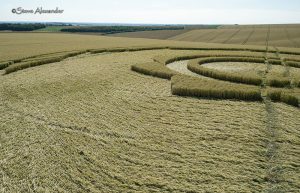 But sometimes, one just has to admit that some crop circles do not have a particular geometrical protocol – some are more like images/drawings rather than geometry. When that is the case, the best you can do is to make the best facsimile you can. Even then, there can be geometric elements to discover, but not a protocol per se. 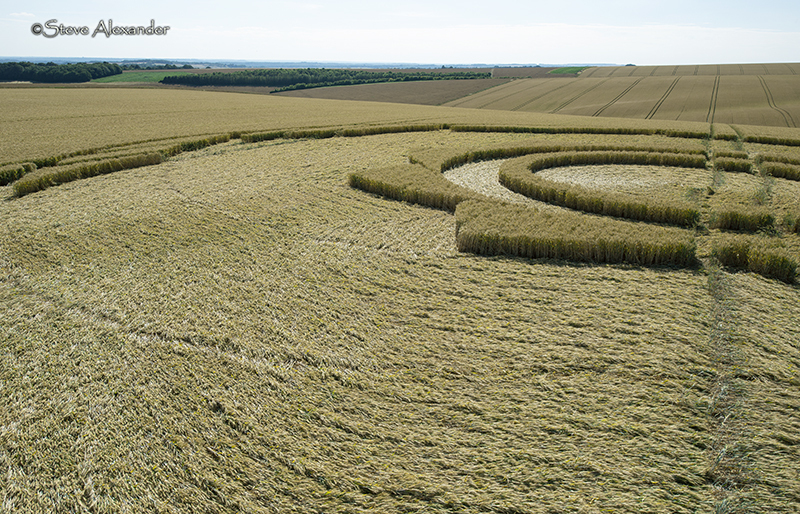 The crop circle that was reported on the 10th of July at Longwood Warren in Hampshire, was both beautiful and intriguing. Its beauty lay not just in its design, but in the flowing-water-like lay of its interior. Its standing elements were few and relatively small compared to the expanse of laid crop in its interior, but when one looked at that interior, in many ways it seemed that that was what the formation was about. Even as we flew over this circle, you were immediately drawn to the frozen movement of that laid interior. The next thing that caught my eye was a series of arcs which could clearly be seen in the floor-lay. There were nine in total, and each moved from the centre and out toward the perimeter. Here was the second geometric clue – the first being the nine chevrons in the centre and the nine arcs around the perimeter of the formation, immediately indicating this was a nine-fold pattern. 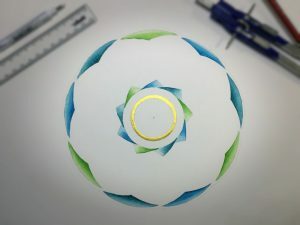 These laid arcs, gave the path of the circumferences needed to create one of the curves of the inner chevrons and the scalloped edge of the perimeter of the formation itself. This would be very useful when it came to drawing the formation later, I thought. On the drawing board those visible arcs did indeed help to create the outer perimeter of the design and one of the curves of the centre chevrons. I was able to quickly draw up most of the formation which is essentially shaped by nine overlapping rings – centred on the perimeter of largest of the central circles – and using the photograph as a guide for the sizing of those rings. At first I thought these nine rings would in fact give the whole design, and I was already into beginning to paint my drawing when I suddenly realised something was wrong. My inner chevrons were too small and one of the curves (the shorter one) was all wrong. The inner Chevrons: Curve A is created by the nine overlapping circles used to create the bulk of the design. However curve B was a mystery. This second curve had me scratching my head for weeks (well months on and off). 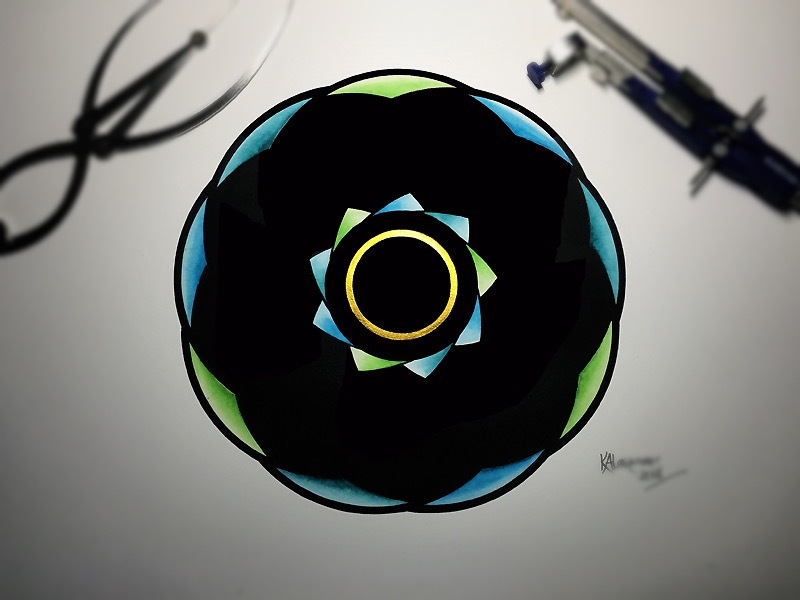 I picked it up and put it down several times, I had at least two long sessions with this circle on my drawing board. However, recently the solution clicked, but not only that, it also revealed something else too. 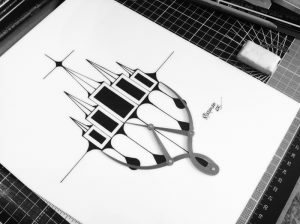 The drawing below shows all the geometric elements finally in place. 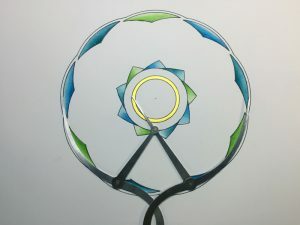 There were two sets of overlapping rings needed to create the inner chevrons. Nine overlapping rings with radius A (A Rings) created the outer perimeter and curve A of the inner chevrons and then a second set of nine rings with radius B (B Rings) created curve B of the inner chevrons. 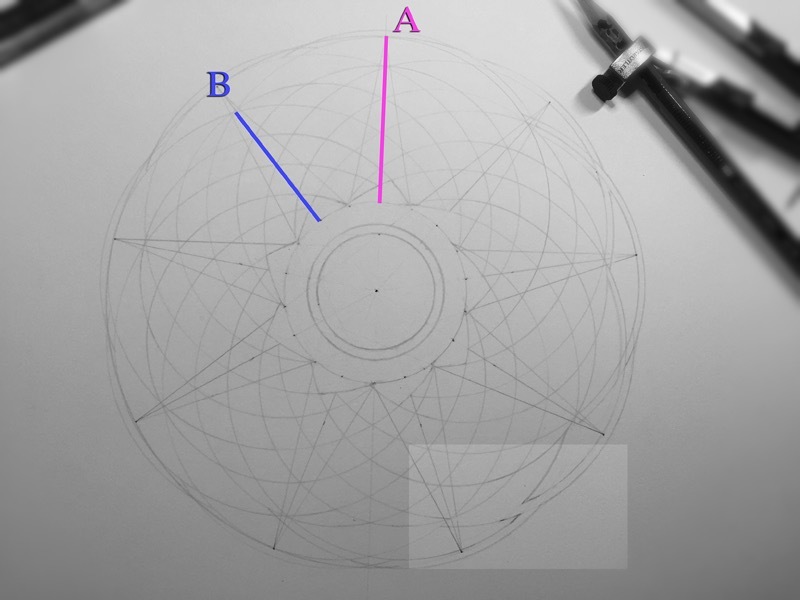 The measurement of radius B was from the central ring used to create all the overlapping rings, to where the A rings overlap to create the standing arcs on the perimeter of the formation. This finally established, the I felt I could go ahead and now draw the formation up again for painting. One final question remained, was there a meaningful relationship between the outer perimeter of the formation and the inner circles? 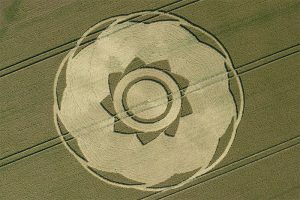 A quick calculation showed that there was indeed and that the largest of the inner circles was created by using a nine-pointed star. If a enneagram star (a thin one rather than a fat one – as there are two nine-pointed stars possible) is drawn touching the perimeter of the formation then the inner circle from which all the overlapping circles are centred, sits just where the arms of the star intersect. Beautiful! – see the picture below. All the construction lines are removed to reveal the standing elements in the formation. Now, there were just a few finishing details to get right and a final protocol to be tried out. Firstly were the arcs on the perimeter of the formation. Because the rings with radius A are bands and not thin rings they had width. It was not necessary for my paining to have all the circles drawn with this width, I only drew it in as they reached the perimeter so that it was possible to recreate the way the arcs did not touch, but had an offset gap between them. This offset is only possible if the lines have width. Looking at the picture above you can see that I have begin to take out the cross over elements to create this gap in the highlighted box. This considerate gap also allows visitors to walk between the elements at ground level without the need to trample anymore of the crop. The inner most standing ring is in a Phi relationship to the outer perimeter of the design. 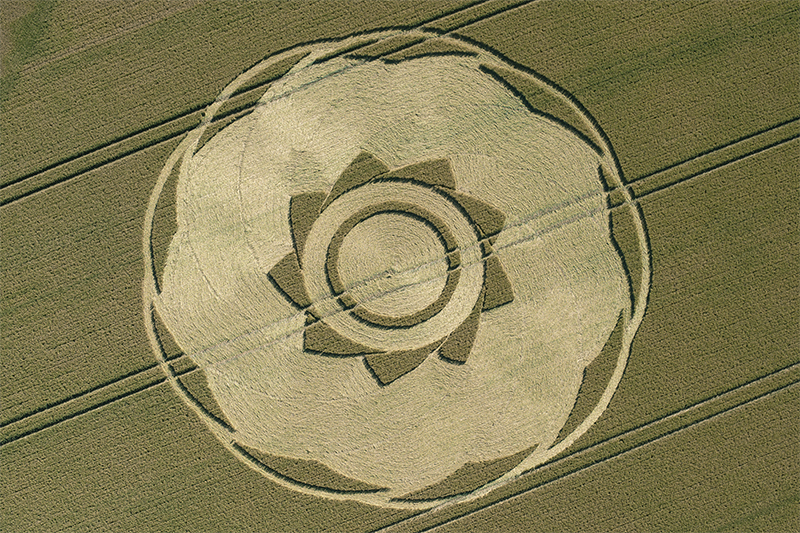 Finally, as with all my drawings, I looked for the Golden Section (phi) – as it is found with some regularity in crop circle design. I did indeed find a phi ratio which gave the width of the inner most standing ring. I decided to paint that ring gold in honour of its proportion in relation to the entire formation. After working on this drawing for such a long it felt good to finally have it finished! The drawing now complete, it was now time to reflect further on the number nine. I had been chatting recently about the number nine with some friends of mine. I have always seen the number nine as the number of threshold, something not quite complete, but on the cusp of … something. My friends seemed to consider that the number nine represented completeness or a zenith, and they quoted the nine months of pregnancy as an example. Nine is the final single digit number (the next being ten, the first double digit number), so I could see how it might be considered as signifying completeness in that regard. However, in the end we had to agree to disagree over this. If we take the example of pregnancy lasting nine months, then surely this is the threshold moment. The babe may be fully grown, but it has still not crossed the threshold of the birth canal into the world, it has not yet taken its first breath, it is still not separated from its mother – not quite a viable life in its own right. Surely only after birth is the pregnancy complete? According to author Wolfgang Held, nine is the ‘almost perfect’ number, it is the last step before perfection, but not perfection itself. In some ancient cosmological systems there were nine realms of angels surrounding the Earth before one reached heaven, and if possession is nine tenths of the law, then it is not the totality of it. However all that said, nine is a wonderful number, we dress up to the nines, we go the whole nine yards, and if we’re lucky we get to feel on cloud nine too! Note: Clicking on any of the images on this blog will bring up a larger image for you to look at. Jonathan-Paul DeVierville & Albert Lamb – for their thoughts.